Why go to the islands when one can bask away under the sun, breath the fresh air and swim in the sparkling clear waters fed by the majestic mountains streams and waterways surrounding Lake Chatuge. 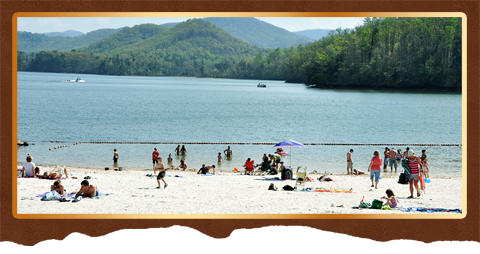 This parkland’s lake shore site is open free to the public and has a beach full of sand, a bathhouse, several free standing bench swings, a playground, picnic tables and pavilion all conveniently located on edge of the town of Hiawassee. The beach and swim area are tucked away on the southern side of highway 76 just east of the fairground’s entrance and safely located near the highway bridge that crosses the upper and lower section of Lake Chatuge. This picturesque setting within a lake, forest and mountains are ideal for the whole family, kids and friends alike.